Sanitary Lathe, complete with dual tapered spindles, 120V AC, 1/2 HP, 60 Hz. 3450 RPM, exhaust ducting and dual tapered spindles (chucks) in a sanitary enclosure. 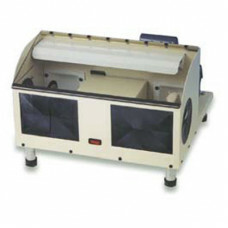 Medium size (17"W x 12"D x 12"H, 55lbs) keeps unit compact but provides adequate internal working space.